Dr. Joel Haber is not just a clinical psychologist. He’s a dynamic speaker who connects, empathizes, engages and makes a real difference in the lives of those who have been and are being bullied. He speaks to the targets, their loved ones and those responsible for ending abusive behavior in schools, on playgrounds, down the hall and in the workplace. His presentations are compelling and effective and provide attendees with useful practical knowledge. The following are a sampling of the speeches Dr. Haber has given over his career. These reinforce his expertise as an anti-bullying speaker and his understanding of bullying behavior. (Oct. 16th, 2013) Dr. Haber discussed bullying and violence prevention in American and South Korean schools with the first South Korean bullying prevention advocacy group. “Why should we talk about bully prevention?” –Why bullying prevention is important for camper and staff retention. “The Biggest Fear of Staff” – Civility in camps and society, staff-on-staff bullying, camper-on-staff bullying, and staff fear that elevating bullying problems to management might result in termination. “The Four Types of Bullying” – Physical and verbal bullying, exclusionary behavior, and cyberbullying in camp settings. “The First 48 hours of staff training” – Social hierarchies formed early on by counselors can set the tone for the camp’s culture as a whole. “Social Laddering” – Social group and hierarchy formation, bullying behavior as an attempt to avoid being on the bottom of the hierarchy. “A Social Laddering Experiment” – A method to illustrate social laddering for staff during workshops. 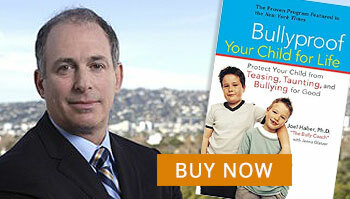 “The Litigation Issue” – Bully prevention steps camps can take to avoid litigation and litigious threats. WCBS 2 New York – Bullying in schools: An emphasis on coaching as a means to combat bullying. Parents should not directly intervene and should remain calm around their children. Discussion of the growing prevalence of bully coaching and training programs across the country. WCBS 2 New York – Summer camp bullying: Topics include role-playing counselor training, deleterious effects of bullying, economic effects of bullying in camps (poor camper retention rates) and the necessity of immediate intervention for suspected bullying issues. WUSA 9, Washington DC CBS affiliate interview (Jan. 19th, 2011) – Bully coaching overview. Dr. Haber urges parents to stay calm, not intervene directly, and role-play with kids to help them devise anti-bullying strategies. Advice for parents on observing children for cyberbullying activity.